The author feels that he is capable of writing a true and unvarnished history of “Billy the Kid,” as he was personally acquainted with him, and assisted in his capture, by furnishing Sheriff Pat Garrett with three of his fighting cowboys–Jas. H. East, Lee Hall and Lon Chambers. 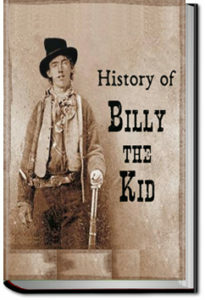 The facts set down in this narrative were gotten from the lips of “Billy the Kid,” himself, and from such men as Pat Garrett, John W. Poe, Kip McKinnie, Charlie Wall, the Coe brothers, Tom O’Phalliard, Henry Brown, John Middleton, Martin Chavez, and Ash Upson. All these men took an active part, for or against, the “Kid.” Ash Upson had known him from childhood, and was considered one of the family, for several years, in his mother’s home. This entry was posted in Reading on December 23, 2017 by all-you-can-books.